Halyard Lead Blocks are designed to turn a line 90°, and commonly used for turning a Halyard or Reef line at the base of the Mast to lead it along the Deck. Usually attached to the Deck, Hinged varieties are especially useful when attachment to the Mast is required. See also: Stand Up Spring Blocks, and other Blocks. See also: Isomat/ Sparcraft, and Z-Spar Mast Base Turning Blocks. Rig-Rite stocks a large selection of Halyard Lead Blocks from a variety of manufacturers, most are listed here. For Halyard Lead Blocks not listed, please contact us with complete information, including Manufacturer's part number or a sketch or photo of the item(s) with dimensions. Fixed Halyard Lead Blocks are usually mounted to the Deck, for turning a Halyard or Reef line at the base of the Mast. Those listed here are attached with 4 Screws. Schaefer 02 Halyard Lead Block has 1 1/16" Delrin Sheave for use with up to 5/16" line. Unit is (maximum) 1 5/8" tall, Base is 1 1/2" long x 1 1/2" wide, and attaches to deck with (4) 3/16" (#10) RH screws on 1" x 1 3/16" centers. Schaefer 03 Halyard Lead Block has 1 7/16" Delrin Sheave(s) for use with up to 7/16" line. Unit is (maximum) 2" tall, Base is 1 3/4" long x 1 11/16" wide, and attaches to deck with (4) 3/16" (#10) RH screws on 1 1/4" x 1 5/16" centers. Schaefer 05 Halyard Lead Block has 2" Delrin Sheave(s) for use with up to 7/16" line. Unit is (maximum) 2 5/8" tall, Base is 2 3/16" long x 2" wide (Double is 2 3/4" wide), and attaches to deck with (4) 3/16" (#10) RH screws on 1 7/16" x 1 1/2" (Double 2 3/4") centers. Schaefer 07 Halyard Lead Block has 2 3/8" Sheave for use with up to 5/8" line. Unit is (maximum) 3 1/4" tall, Base is 2 7/8" long x 2 7/16" wide, and attaches to deck with (4) 1/4" RH screws on 2 1/16" x 1 13/16" centers. Nicro-Fico Double Halyard Lead Block with 2" Delrin Sheaves for use with up to 1/2" line. Unit is (maximum) 2 1/2" tall, Base is 2 3/8" long x 2 3/4" wide, and attaches to deck with (4) 3/16" (#10) RH screws on 2 3/8" x 1 11/16" centers. 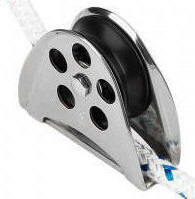 Nicro-Fico Swiveling Halyard Lead Block with 2" Delrin Sheaves for use with up to 1/2" line. Unit is (maximum) 2 7/8" tall, Base is 2 3/16" diameter and attaches to deck with (4) 3/16" (#10) RH screws on 1 7/16" circle centers. Fixed Halyard Lead Blocks are usually mounted to the Deck, for turning a Halyard or Reef line at the base of the Mast. Those listed here are attached with 2 Screws. Schaefer 02-Series Fixed Halyard Lead Block with 1 1/16" Ball-Bearing Sheave for use with up to 5/16" line. Unit is (maximum) 1 1/2" tall, Base is 1 5/8" long x 3/4" wide, and attaches to deck with (2) 3/16" (#10) screws on 1 1/4" centers. SWL is 500 lbs. (225Kg). Schaefer 03-Series Fixed Halyard Lead Block with 1 7/16" Ball-Bearing Sheave for use with up to 7/16" line. Unit is (maximum) 2" tall, Base is 2 1/8" long x 3/4" wide, and attaches to deck with (2) 3/16" (#10) screws on 1 3/4" centers. SWL is 1000 lbs. (454Kg). Schaefer 05-Series Fixed Halyard Lead Block with 2" Ball-Bearing Sheave for use with up to 7/16" line. Unit is (maximum) 2 5/8" tall, Base is 3" long x 13/16" wide, and attaches to deck with (2) 1/4" RH screws on 2 1/4" centers. SWL is 1000 lbs. (454Kg). Schaefer 08 'Half-moon' Fixed Halyard Lead Block with 2 3/8" Delrin Sheave for use with up to 5/8" line. Unit is (maximum) 3 3/16" tall, Base is 3 5/16" long x 1 5/8" wide, and attaches to deck with (2) 1/4" RH screws on 3" centers. SWL is 3000 lbs. (1361Kg). Schaefer 08 'Half-moon' Fixed Halyard Lead Block with 2 3/8" Aluminum Sheave for use with up to 5/8" line. Unit is (maximum) 3 3/16" tall, Base is 3 5/16" long x 1 5/8" wide, and attaches to deck with (2) 1/4" RH screws on 3" centers. Aluminum UC Circuit Sheave has Torlon Ball Bearings for minimum friction. SWL is 3000 lbs. (1361Kg). Schaefer 10-Series 'Half-moon' Fixed Halyard Lead Block with 3 1/4" Sheave for use with up to 3/4" line. Unit is (maximum) 4 3/16" tall, Base is 5" long x 1" wide, and attaches to deck with (2) 5/16" screws (1 RH & 1 FH) on 4" centers. Hinged Halyard Lead Blocks can be mounted to the Deck but are commonly used on the Mast, the Hinge allows the Block to align with off-center loads. Narrow Base varieties are especially useful when attachment to the Mast is required as several can be mounted in a small space. Note: When attached to the Mast, we recommend putting Nuts inside the Mast. Schaefer 03-Series Narrow Base Hinged Halyard Lead Block with 1 7/16" Ball-Bearing Sheave for use with up to 7/16" line. Unit is (maximum) 2 1/2" tall, Base is 2 1/2" long x 3/4" wide, and is attached with (2) 3/16" (#10) FH screws on 1 3/4" centers. Narrow Base with Hinge allows for Mast attachment on any Spar Section. SWL is 1000 lbs. (454Kg). Schaefer 05-Series Narrow Base Hinged Halyard Lead Block with 2" Ball-Bearing Sheave for use with up to 1/2" line. Unit is (maximum) 3 1/8" tall, Base is 3 1/4" long x 7/8" wide, and is attached with (2) 1/4" FH screws on 1 3/4" centers. Narrow Base with Hinge allows for Mast attachment on any Spar Section. SWL is 1000 lbs. (454Kg). Schaefer 05-Series Narrow Base Hinged Halyard Lead Block with 2" Aluminum Sheave for use with up to 1/2" line or up to 3/16" wire. Unit is (maximum) 3 5/8" tall, Narrow Base is 2 3/4" long x 3/4" wide, and attaches to mounting surface with (3) 1/4" FH screws on 27/64" (<7/8") centers. Narrow Base with Hinge allows for Mast attachment on any Spar Section. Schaefer 08-Series Narrow Base 'Half-moon' Hinged Halyard Lead Block with 2 3/8" Aluminum Sheave for use with up to 5/8" line. Unit is (maximum) 3 3/16" tall, Base is 4 9/16" long x 3/4" wide, and is attached to mounting surface with (4) 1/4" FH screws on 1 1/8" centers. SWL is 3000 lbs. (1361Kg). Schaefer 08-Series 'Half-moon' Hinged Halyard Lead Block with 2 3/8" Aluminum Sheave for use with up to 5/8" line. Spring-loaded Block is used on Deck, Spring keeps Sheave upright when not under load. Unit is (maximum) 3 3/16" tall, Base is 3 5/16" long x 1 5/8" wide, and attaches to deck with (2) 1/4" RH screws on 3" x 1 5/16" centers. SWL is 3000 lbs. (1361Kg). Schaefer 08-Series 'Half-moon' Hinged Halyard Lead Block with 2 3/8" Aluminum UC Ball-Bearing Sheave for use with up to 5/8" line. Spring-loaded Block is used on Deck, Spring keeps Sheave upright when not under load. Unit is (maximum) 3 3/16" tall, Base is 3 5/16" long x 1 5/8" wide, and attaches to deck with (2) 1/4" RH screws on 3" x 1 5/16" centers. Aluminum UC Circuit Sheave has Torlon Ball Bearings for minimum friction. SWL is 3000 lbs. (1361Kg).